Backyard bog gardens, whether floating, container or in-ground, can create unique havens for wildlife and show off some really interesting native plant species. 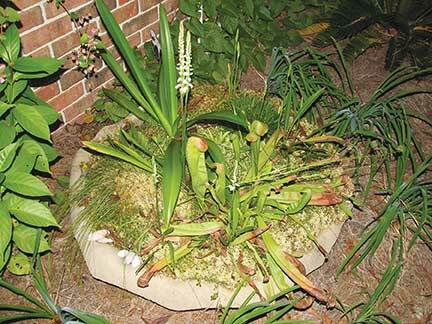 After many years of gardening for fruits and vegetables, my wife and I recently discovered that bog gardens are a carefree addition to the home landscape and are easy to build and very hardy. Their four-season beauty is an ever-changing conversation piece. In addition to the beauty of the plants themselves, many different critters love flying over, crawling through and alighting in a plant-filled backyard bog. Dragonflies are most obvious, both in the air and perched seeking prey and mates. Frogs, toads and salamanders creep in quietly to eat, vocalize and reproduce. Birds use the bog garden to collect insects and nest materials, and butterflies and bees find flowers with abundant nectar and pollen. And a few bugs end up on the menu of our insect-eating plants. 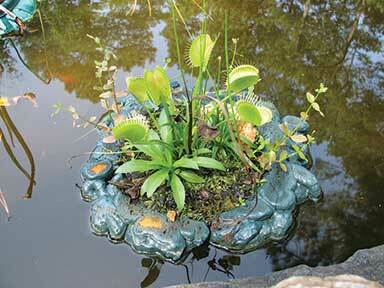 But, before you can enjoy your bog garden, you have to build it. Critical elements in planning a bog garden include choosing the proper container or site, using the proper mix of growing media, selecting appropriate plants and providing just a little upkeep. Our first bog garden consisted of a few pots on a shelf in the shallow water of our garden pond. Eventually, we added floating pots and started a small bog in the bowl of a repurposed concrete birdbath, where we planted dwarf pitcher plants, rose pogonia orchids from a nursery, bog buttons from my family's farm pond, a blue-flowered butterwort and, showiest of all, a nursery selection of white spider lilies, Hymenocallis occidentalis. Our enthusiasm for bog plants soon overcrowded the garden pond with floating pots, which led us to our largest undertaking yet - an in-ground crescent-shaped bog snuggled up against our existing garden pond. 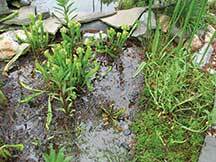 While bog gardening is fun, learning about it by trial and error can be frustrating and expensive. To help you save some time and money, here are a few tips to get you started. We use the same media in our container bogs and our in-ground bog. My recipe is three to four parts of pine bark mini-nuggets or any pine bark with 1.5- to 2.5-inch pieces, mixed with one part clean, coarse, washed sand - often called builders sand. Don't use beach sand or sandbox sand. Using a large hand trowel or small shovel, I blend dampened bark and sand in a separate container. Dry media does not mix well. A little mushroom compost mixed in is also okay. To make the small floating bogs I call plant buoys, I use expanding spray-foam insulation to create a floatation collar around the rim of a basic plastic pot. Always use gloves and wear old clothes when doing this, because the fresh foam is very sticky. I'd also suggest making several pots at one time to use up all the foam in the can, as it is prone to clogging with second use. To make the flotation collar, turn a rigid plastic pot with a rim upside down on wax paper on a flat, level surface. Spray a ring of foam around the pot just below the rim, forming a collar two inches or more deep and wide. Let the foam dry overnight on the paper. The foam cures to a golden color in the sun and lasts several years; it can also be painted. Cut extra 3/4-inch drain holes in the pot. 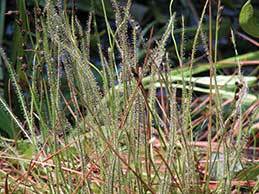 Media in floating pots should be lighter weight, mostly pine bark with long-fiber sphagnum on top. To make an in-ground bog, dig out and level a twelve-inch-deep hole with straight sides. Remove roots, debris and sharp objects. 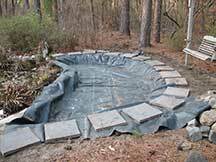 Line the area with a rubber pond liner large enough to overlap the sides. Anchor the liner edge with heavy objects like rocks or flagstones. In rocky areas lay old carpet or carpet pad under the liner. After adding pine bark/sand media to the bog and filling it with water, use a piece of steel rebar to punch three or four drain holes spaced across the center length. The bog is ready to plant after soaking a few days, but wait for warm weather. 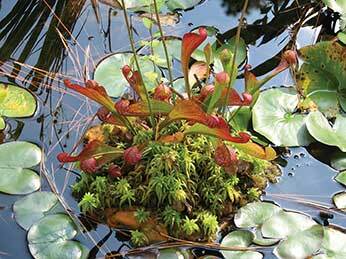 Some bog plants are new to the nursery industry, so it helps to search for them in catalogs and on the Internet by their scientific name (see More Species for Outdoor Bog Gardens). Be aware that some bog plants growing in nursery greenhouses are tropical and will not survive our winters, and even hardy plants grown in a greenhouse must be acclimated outdoors well before the first freeze. 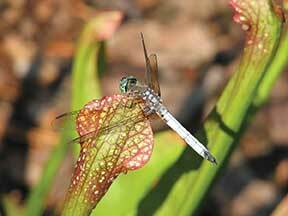 Pitcher plants in the genus Sarracenia are mostly southeastern natives. Eleven species are now recognized in the U.S. with five found wild in South Carolina. 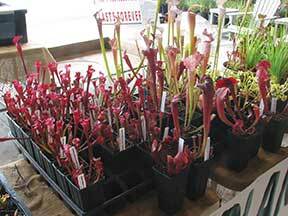 Palmetto State natives include the yellow, mountain sweet, hooded (or dwarf), purple (or hunter's cup) and red (or sweet) pitcher plants. The Venus flytrap is native to the coastal plains of South and North Carolina. 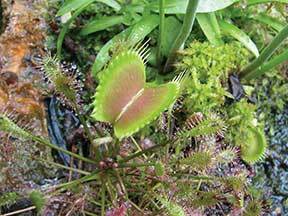 Flytraps and their habitat are endangered, so do not dig wild plants or buy them from a nursery that wild digs. Venus flytraps and several named varieties are ethically propagated and sold by local and Internet nurseries. 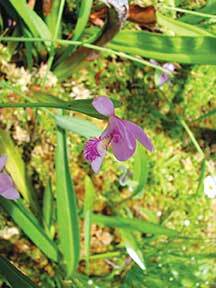 They grow best at the edge of a small container bog or in a floating bog pot. Some plants are both beautiful and a little pesky. Cardinalflower and ladies tresses put on a great show during their fall flowering peaks, but both must be kept under control by cutting off bloom heads before seeding and removing extra plants. Sundews of the Drosera genus are tiny bug catchers armed with glue-tipped hairs. Most species are less than two inches across and not much taller, except for the hardy threadleaf sundew, Drosera filiformis. Stokes aster or Stokesia is a common garden plant, and a native Southern species often found in natural bogs. Named garden varieties are usually purple, but Stokes asters also come in white, near pink and yellow. Marsh pinks, like Sabatia kennedyana, are show-stoppers, with evergreen clumps, large daisy-like blooms every summer and just enough seedlings. The outstanding flowers attract insects seeking pollen, nectar and perches. Fall cardinalflower typically blooms bright red in the wild, but nursery varieties can be found in white, bi-colors and a color named Pee Dee flamingo introduced by nurserywoman Ursula Herz of Socastee. 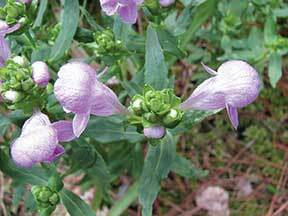 Carolina bogmint, Macbridea caroliniana, is a fall perennial with pink helmet-like flowers. A bit invasive, it is easy to uproot to give away or plant elsewhere. Discovered in South Carolina by the state's first botanist, Thomas Walter, the species was renamed for Dr. James McBride of Pineville, a medical doctor and botanist who died in 1817 in Charleston while treating patients during a yellow fever epidemic. Our blue-flowered butterworts, Pinguicula primuliflora, all came from one tiny plant that I bought years ago from a chain home store. The plant grew to be five inches across and now forms new plants at the tips of its long yellowish leaves. Bog-friendly ground covers like sphagnum moss can be started from dried, long-fiber sphagnum or a handful of live sphagnum. Shade mudflower, found at nurseries as an aquatic, also makes a good annual groundcover, with its flat carpet of small round leaves. Sphagnum should be pulled away or tamped down to prevent covering the crowns of low-growing plants like sundews and Venus flytraps. Once a bog pot fills up with expanding and seedling plants, it's time to divide, remove, create new bogs and share with fellow gardeners. A portable container bog, with instructions on its maintenance, is a gift that can last a lifetime and be passed on to others. Outdoor bog gardens offer advantages over typical gardening, since the plants are very hardy outdoors, need no fertilizer or chemical enhancements, and are easy to plant and to care for. Bog gardening feels like gardening on a new planet because the environment is not the typical yard landscape. Container bogs and in-ground bogs have multiple seasons of interest, educating both young and old by observation, explanation and photography. They can also solve home landscaping problems because the containers are portable and an in-ground bog can often be built where no other plantings have worked. 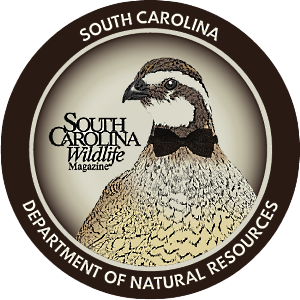 It is illegal to collect plants and seeds from the naturally-occurring bogs on protected public lands managed by the S.C. Department of Natural Resources, S.C. Forestry Commission, U.S. Fish and Wildlife Service, U.S. Forest Service and other conservation organizations. Such areas are refuges to protect the plants, natural communities and associated animals from extinction. For the aspiring bog gardener, these protected wild areas should be places for photography, learning plant species and recording ideas for homemade bogs only! Local, mail order and Internet nurseries offer an increasing variety of ethically propagated, garden-tested bog plants and hybrids to use in gardening. Barbara's buttons (Marshallia graminifolia, grandiflora), etc. Retired DNR public information specialist, freelance writer and accomplished amateur naturalist Mike Creel has extensive experience gardening with native South Carolina plants. 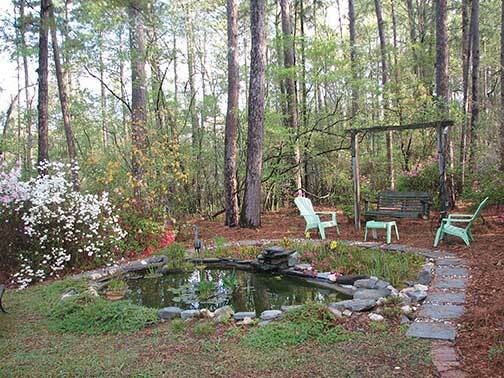 The South Carolina Botanical Garden at Clemson University has a native plant display bog and an annual plant sale. Visit www.clemson.edu/public/scbg or call (864) 656-3405 for more information.